The upside protection I added to the December iron condor on October 15 has proven to be a profitable adjustment. As the market wandered higher, I was able to bleed off theta while keeping the position pretty close to delta-neutral. I've had some low-ball exiting orders working for a while, since getting out is still in front of me, and yesterday one of those orders filled, closing out a portion of my 620/610 put spread and locking in a nice profit on that portion. My work schedule yesterday was weird, so I didn't actually notice the fill until this morning before the open. When I came in this morning, I discovered that between the closing of part of the put spread and the traveling of the market down the curve toward my call spread, my overall position was -20 delta. That's a lot more delta-negative than I want it to be, so I started looking at ways to adjust it again. My original plan was to bring the delta back to nearly 0 without turning the theta negative or increasing the overall risk, since after all I have only a little more than a month before expiry, and increasing position at this stage would be kind of dumb. But the more analysis I do, it seems the best choice is to just close the position entirely. From where the market closed today, net liquidation value on the position is about 82c per contract. That's pretty close to the 1.00/contract level that I said made me "thrilled", so that's just fine. I had already started working orders to adjust the delta before the close, and when I do that I always make the position-decreasing orders more aggressive than the position-increasing orders. Today was a good example of why I do this, since only one of my orders filled and I didn't have a chance to adjust my other orders to make sure they filled on the close. As it turns out, that's just as well, since I think I want to cancel my position-increasing orders anyway. 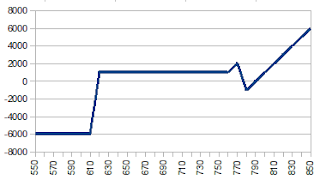 My original plan was to roll the 770/780 call spreads up to 790/800, also decreasing the position. This costs a fair amount of cash, but it also brings my delta up to +4 again, and makes theta a very healthy +9. But what am I really gaining by opening that 790/800 position? My thinking was that I needed to partially finance the 770/780 call spreads, but if I can make 82% of my "thrilled" level just by closing the position, there's no financing I need to do. 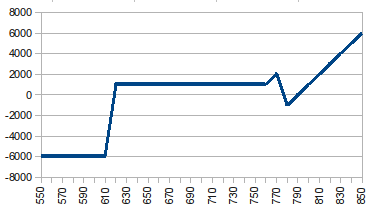 So here's my current position, which reflects the partial closing the 770/780 call spreads, but nothing else. Delta is all out of whack the other way, at +17, and theta is right at 0. I've got orders working to close the rest a little behind the market. Once it's open on Monday, I'll adjust everything around to be just about at the market, and put this December iron condor to rest. Then I'll start looking at opening a new January position. In other news, I was at the FIA Futures and Options Expo on Wednesday and chatted a bit with the people at the Think or Swim booth about why they're so mean about screen shots. I actually talked to a young lady who works with Scott Garland, and she indicated that everyone there is nervous about overstepping their bounds with TD Ameritrade, the recent purchasers of Think or Swim. So far TDA has more less left them alone, but the concern is that they'll get a lot more involved in the day-to-day business instead of just treating ToS like a profit center. I understand their perspective, but I'm still a little steamed that I can't accurately depict my current position value here because of their concerns about intellectual property.